July 4 is an important day all across the country but the Seattle area also has a historic connection to this date. 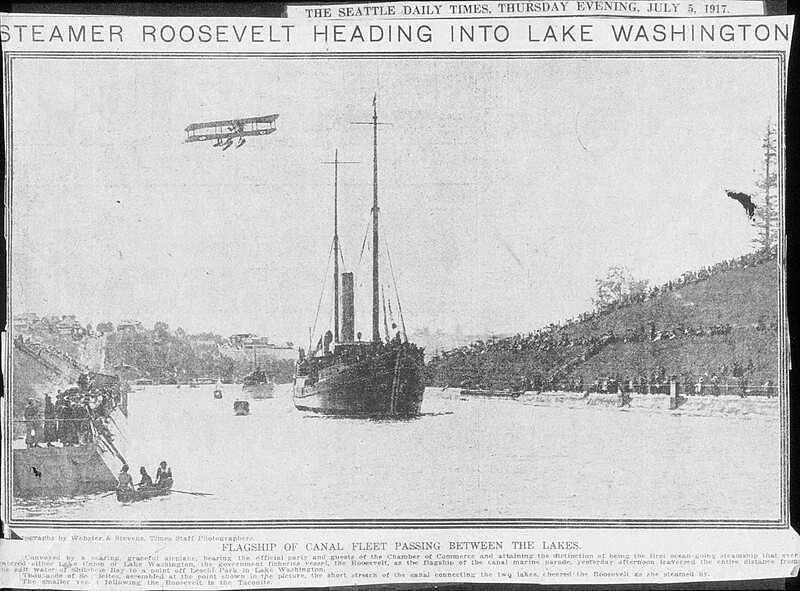 It was July 4, 1917 that the Ballard Locks and Lake Washington Ship Canal were officially opened and inaugurated. Years of hard physical work, engineering challenges, arm twisting, lawsuits and political and commercial maneuvering finally resulted in this historic day. One of our volunteers, Marta Brace, has done considerable research into the history of the ship canal and offers the following article. The following was written by Marta Brace, a volunteer with FOBL. "The history of the Lake Washington Ship Canal and the Chittenden Locks is expansive in the stories and noted histories. For example; without the Lake Washington Canal Association who on March 22, 1907 incorporated to raise the funds to start the dredging and widening of the Montlake Cut and canal system, and to oversee the future funds raised by King County voters, it is undeniably the force behind the actual completion", said Marta Brace. "The actual first shovel of dirt in honor of the successful beginning of what we know today, was actually dug by former Governor John H. McGraw, documented by the Seattle Times Newspaper Oct. of 1909. This event was post AYP Exposition at the south entrance of the fair. In attendance was the president of the Lake Washington Canal Association, John S. Brace, who spoke that day, as well as Judge Thomas Burke a long time advocate for the canal. Judge Roger S. Greene, chairman of the Chamber of Commerce committee on harbors and harbor improvements presided over this historical event." Mollie Myers Merkley the granddaughter of Judge H.A.P Myers noted that the he was key in the legal council over the water law that held a firm hand to overcome legal obstacles. Judge Myers along with Harold Preston and Judge Roger S. Green were the trio who constituted a legal committee for the Lake Washington Canal Association. Let it be known, that without the association the Locks would never have been completed and without the government Locks funded by the federal government, there would be no motivation to complete the canal. Both parts of the project needed each other and it's like minded leaders. The Articles of Incorporation are attached dated MARCH 22, 1907 --- and signed by the brave men who formulated the Lake Washington Canal Association and each put forward $10,000; to assist in the construction of the Lake Washington canal by creating an assessment district to raise $1,000,000. ; John H. McGraw, Thomas Burke, George A. Virtue, C.E. Remsberg, Roger S. Greene and J.S. Brace. Without "this association" the Locks project would have been denied for federal funding at that time and so many times prior in history. This 4th of July marks the date of the celebration of the grand opening JULY 4, 1917. John S. Brace was the chairman of the celebratory committee .